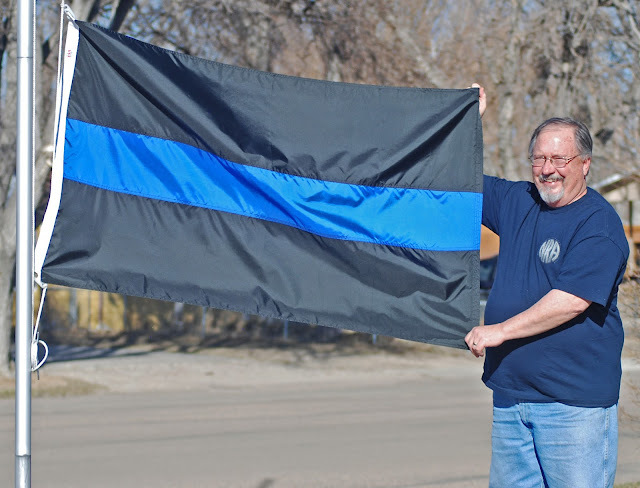 PRO-POLICE FLAG – Greg King, chairman of the Lincoln County Commissioners, shows off his “Thin Blue Line” flag that he displays at his home in Limon. He explained the purpose of the flag is to show support for all law enforcement officers across the nation. “Law enforcement officers are our only defense between us and a lot of bad people,” he said. “I encourage others to also show their support for them.” King plans to place another “Thin Blue Line” flag above the Law Enforcement Memorial in the lobby of the Lincoln County Courthouse.